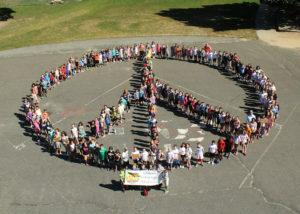 Laddie A. Decker Elementary School 5th grade students recently celebrated International Peace Day. Students kicked off the day by watching a screening of “The Day After Peace,” an inspirational film which follows peace-activist Jeremy Giller as he puts the concept of peace in action during an average day. Following the screening, students were led in small groups to reflect on how they personally can make peace in their lives. To raise awareness and promote international peace, during recess periods the entire 5th grade class gathered on the playground blacktop to create a giant peace sign. The Miller Place School District held this event to teach students the importance of developing a global perspective on conflict and conflict resolution as part of its dedication to providing an outstanding academic and character education for all students. Laddie A. Decker Elementary School encourages students to “think globally and act locally” on their ideas and visions, a program spearheaded by Student Assistance Counselor Phoebe Arancio. Students at Laddie A. Decker Sound Beach School form a peace sign and take a picture on the playground blacktop. They were celebrating the International Day of Peace to raise awareness and reflect on how they can create peace in their own lives.